Each month I join Kurt Achin, host of Koreascape on Seoul’s English-language radio station TBS eFM, for an exploration of one of Seoul’s urban spaces. This time, with Kurt on vacation, I talk to Na Seung-yeon about six distinctive characteristics of Seoul’s urban space as a whole, including its high-rise apartment complexes; its short-hop “village buses”; its culture of rooms, or bang (방), purpose-built for singing, watching movies, and playing board games; its outdoor eating and drinking spots known as pojang macha (포장 마차); and more. 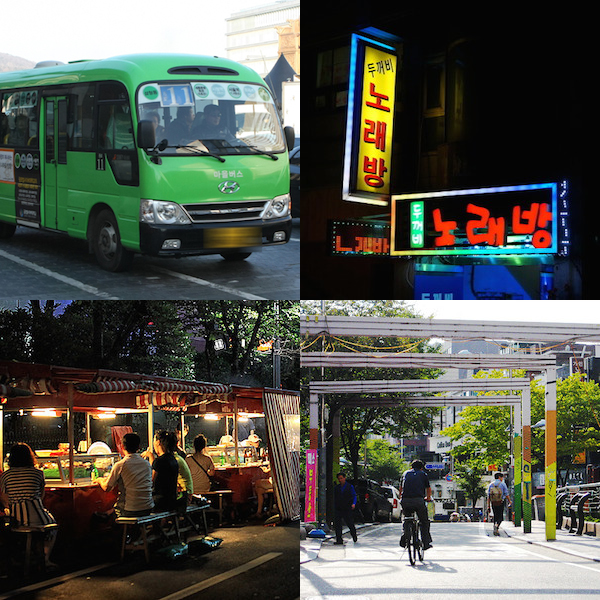 While each of these have potentially positive and negative kinds of impact on urban life, all of them together make the experience of Seoul feel different than that of any other city. This was written by Colin Marshall. Posted on Tuesday, January 23, 2018, at 5:17 pm. Filed under Koreascape, radio, Seoul. Bookmark the permalink. Follow comments here with the RSS feed. Comments are closed, but you can leave a trackback.